The proceeds that the beneficiary receives upon the death of the insured as stated in the life insurance policy. A policy benefit that may be available on joint life insurance policies that waives the premiums after the first death. A bond issued on the general credit of a corporation, but not secured by a specific asset. A term life insurance contract where the face amount of the policy decreases over the length of the contract. The premiums on the contract may not decrease. This type of life insurance is often used for mortgage insurance. 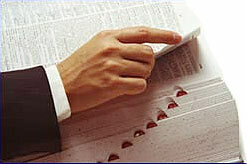 As the outstanding balance of the mortgage decreases, the protection needed may also decrease. A provision in health and property & casualty policies where the insured pays for the first portion of the loss up to a specified dollar amount or for a time period. In a time-period deductible (elimination period or waiting period) there is a specified time prior to the benefit starting. This is common in disability income policies. In dollar-amount deductible, the insured pays for the loss up to the deductible amount. For example, under a $500 deductible on an auto policy, the insured will pay any losses up to $500. If the loss were over $500, the amount over the deductible will be paid by the insurance company up to any limits in the policy. A form of investment risk that a bond or other investment may not pay (default) the principal and/or interest when it becomes due. An annuity contract where consideration is paid in either a single premium or a series of payments and the income benefit is not scheduled to begin until some predetermined date in the future. The scheduled date to begin income benefit payments is greater than one year in the future. Otherwise the annuity would be an immediate annuity. A type of non-qualified pension plan that provides for salary deferral until retirement, death, disability or a predetermined date. A type of retirement plan where the plan specifies the benefits that each employee will receive at retirement. The plan actuary determines the annual employer contribution. Simplified Employee Pension (SEP) Plans. An economic condition that is characterized by the decline in the prices of goods and services (the reverse of inflation). The process whereby a mutual insurance company changes the form of ownership of the company to a stock insurance company. One of the main reasons for this transformation is to allow the insurance company to raise additional capital from new sources. A type of managed care dental insurance plan that provides dental care like a HMO provides medical care. A form of health insurance that helps pay the costs of dental care. The coverage may be offered on an individual or group basis. The decline in the value of an asset or investment. An investment whose value is derived from the price movement of the underlying security. Some of the derivatives are leveraged to multiply the movement. This produces substantial gains or losses for a relatively small investment. This program allows investors to participate directly in the cash flow and tax benefits of the underlying investments, usually in the form of limited partnerships. An insurance marketing systems where the insurance company sells insurance products directly to the consumer without the use of an insurance agent. This may be through direct mail, telephone solicitation, media advertising or via the Internet. A health insurance policy that provides payments in the event the insured is unable to work due to illness, sickness or accident. The time period after which an annuity has annuitized and the insurance company begins to make payments to the annuitant or beneficiary. An investment strategy that involves establishing a portfolio of different investments by mixing industries and types of assets to spread their risk. In this way a particular event (introduction of automobiles, for example) will have less impact on the investor's total portfolio than if you owned a single investment in a buggy whip company. In other words, don't put all your eggs in one basket. A distribution of the earnings of a corporation paid to the common and preferred stockholders. An amount that is returned to the policy owner by the insurance company on participating policies. The policy dividend from an insurance company is not considered a taxable distribution by the IRS, but as a refund of a portion of the premium paid. Purchase Extended Term Life Insurance. Note: Generally the yield is higher on these stocks as the result of a low price resulting from the stock being out of favor with investors. An investment timing strategy where an investment of a constant amount is made in the same security or mutual fund at regular time intervals, regardless of the market prices or conditions. Also see Example Of Dollar Cost Averaging. An insurance company that is incorporated (or domiciled) in the state where the risk is located and the policy is issued. Also see alien insurer and foreign insurer. The state in which an insurance company is chartered and has its headquarters. The oldest of the stock indexes and possibly the most quoted. The average was begun in 1896 by Charles Dow, a founder of the Wall Street Journal. The index is composed of 30 widely held New York Stock Exchange listed stocks that provide an indication to investors of how the stock market is doing. General Electric is the only stock in the index that was in the original index. A form of health insurance that covers only specified catastrophic diseases such as cancer. The licensing of a registered representative with more than one broker-dealer.